Food supplement Slim Extreme weight loss enhancement, appetite suppression, with glucomannan – highly effective body mass reduction ally. weight rationally. It also helps maintain beautiful skin whilst using weight loss diets. This product is suitable for vegetarians and vegans. Effervescent tablets grape flavour. 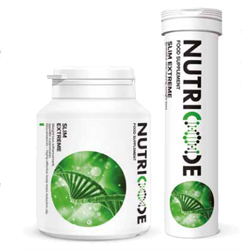 Intended to supplement the vitamins and minerals which are lost by reducing the daily food intake. Some diets additionally affect the loss of vitamins and minerals. Slim Extreme Tablets are a perfect complement to dieting: a set of carefully selected vitamins and minerals essential for maintaining beautiful skin. Vitamin C supports formation of collagen which is indispensable for the normal function of skin. Biotin takes care of proper metabolism of energy and macronutrients, along with vitamin B2 which helps maintain a healthy complexion. Calcium has an effect on the proper functioning of digestive enzymes. Dissolve 1 tablet in a glass (200 ml) water a day. Drink before a meal. Coated tablets. Based on an innovative ingredient – glucomannan – which, when combined with a balanced diet, affects weight loss. Chromium helps maintain normal blood glucose levels, by reducing cravings for sweets and the desire to snack between meals. Zinc supports a balanced diet as it takes care of proper metabolism of carbohydrates, fatty acids and macronutrients as well as helps in the proper synthesis of proteins involved in metabolism. Garcinia cambogia extract, in turn, is a source of hydroxycitric acid (HCA), which slows down the formation of body fat. Take 2 tablets 3 times a day. Consume with plenty of water (1 or 2 glasses).